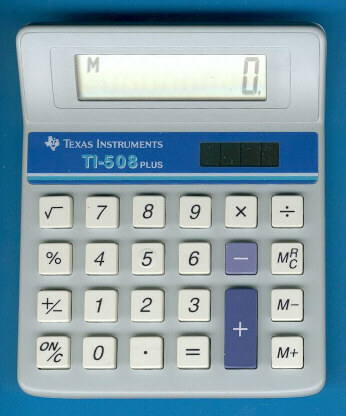 This TI-508 PLUS was introduced in 1992 together with the similiar looking TI-1795+. It followed the original TI-508 and still hides the secret why more or less identical calculators carry a "Handheld (TI-5xx)" or "Desktop (TI-17xx)" designation. Dismantling the TI-508 PLUS is not very exciting. The calculator makes use of a typical OEM design assembled in far-east. © Joerg Woerner, January 12, 2004. No reprints without written permission.